This weekend, I made some changes to my site and want to explain the benefits to you, my readers. Yesterday I told you about RSS feeders and how they keep clutter out of your email boxes and your computer out of the repair shop (with viruses). Today I’d like to tell you about my “Tag Cloud.” If you will look in my sidebar (to the right), you will see a bunch of words – in alphabetical order – that are the tags associated with the 50+ articles I’ve written for this blog. It can also be called a Word Cloud; it refers to the tags for this blog only. 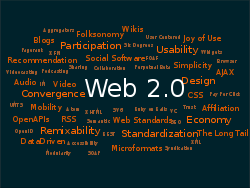 Each weblog has its own cloud of terms. Please note that the phrases are in varying sizes. Why should you care? Good question. The answer is that it saves YOU time. Perhaps you’re like me and like to troll blogs. Sites that have this cloud make it easy for the troll-er to quickly see what’s going on in this blog. Here’s another benefit: You can see tags that you might be interested in and then click the words. Instantly, you are taken to the postings related to the tag. In other words, you might not have known that I wrote articles on ‘pin feathers’ or ‘clothes with UV brighteners’ or ‘rear window graphics.’ Now you do AND you can read them. Another way of looking at this is that now you can see all of my tags – everything I’ve written about – without having to backtrack through each posting. You also can zip over to exactly those articles – instantly. This is a real time saver! I’m always looking for ways to make my content more relevant and useful. I hope this helps!